The property managers are worth the trip here! You meet Paula and you feel like she’s known you for years. Very friendly. We stayed in unit #18 which was perfect for our two kids. One bedroom and a foldout couch was all we needed. Fully stocked kitchen if you chose to stay in. Small but clean pool. Access to the beach, which though is small, it is beautiful. The rooms were a bit darker, they could be brightened, and a few things were showing their age. But while its not frilly and pretentious, it feels very welcoming. Very close to everything. Definitely will stay again. Our rental was amazing. Very nicely decorated and appointed with all the amenities you could want. The place was very clean and very comfortable. The complex is older and dwarfed by two taller and fancier places on either side, but unless “new” is all you want, this place has it all. The pool, although in pictures looks like a regular pool, is very small but clean and refreshing. but it is the beach that is the selling point. Only steps from your condo is a lovely lawn area with umbrellas and lots of loungers, chairs and a BBQ. 10 more steps away is a beautiful sand beach, offering lots of walking in either direction. shops and restaurants a short beach walk away, or shorter drive. The sunset is lovely and although the waves can get big, were just enough to enjoy some bobbing time in the ocean. The location is central to all the amazing sites in Maui that we participated in. Parking is included and you do need a car. We will DEFINITELY go back to this condo if we ever travel to Hawaii again and if Hawaii wasn’t so darn far away, I’d consider buying here. At first glance, the place doesn’t look like much however the inside (we had unit #5) is spacious (living room with sofa bed, kitchen, bedroom with king size bed and bathroom and a big balcony with a table, 4 chairs, 2 outdoor sofas and sometimes a cat), very clean, fully equipped and seemed to have been renovated recently. The location is also nice; 20 minutes from the airport, and just a few minutes from most everything else. It seems that there’s also a good snorkeling spot on the beach about a mile to the west, but we didn’t have time to go there (too many things to do in Maui and not enough time). My son and I were able to do all the major activities in a few days due to its great central location, even with a beach onsite. Also a large covered lanai for wonderful meals outdoors. Well equipped with modern conveniences inside the unit. Would have wished for a firmer bed but really no other suggestions. This is an older property and the unit (#13) we rented showed its age. There are some things, like the kitchen that are outdated however the furnishings are current and the unit was very comfortable. The location is great and centrally located on Maui in north Kihei. This property is also right on the beach so beach access is great and they also have a pool. Although the maximum temperature we saw was about 80F the 2 window units were adequate. Mornings were nice and you could open the windows if you wanted. That was at about 65F. Overall great value for the money! We were out exploring and doing things so we really only used the condo for sleeping and a little resting. I would stay again. This place is a favorite! Comfortable, impeccably clean unit with air conditioning. Plenty of parking; the softest sand imaginable ( Sugar Beach) and the beautiful ocean right at the end of a walkway. Tropical flowers everywhere, helpful and friendly staff. There’s a palm tree outside the office with dancing fairy lights after dark- pure magic! If you need a crystalline massive swimming pool or are a smoker, this isn’t the place for you. For us, it couldn’t be better. Great condo! One of the best I have ever stayed it! My family and I recently visited Maui and we decided to stay in this condo and it was a great choice! This condo had everything you could ever need and the location was stunning! It was clean and everything was up to date! Right on sugar beach (which is great swimming beach for families, nice calm waves) it was a great place to people watch while you sit back and watch the sun rise with coffee or watch the sunset with a glass of wine. Something that was a huge thing to me was that it had hot water! I know it seems like a given for a condo to have hot water; since you are paying so much to stay there!! duhhh!! but my family and I stayed in a condo on Oahu and it did NOT have hot water, and we had to shower in like an outdoor camp shower. So, low and behold when this place had hot water, I was sold. The other thing that was amazing was the noise from the ocean. Even with the door and all the windows closed you could hear the ocean crashing and it was so soothing (but was super loud with the windows open; nice during the day but made it a little hard to sleep at night. Natures noise maker, made a little too much noise lol) This condo complex is also within walking distance of an ABC store, a little bakery and a shave ice place, which was great for families Lastly, THERE WAS NO ROAD NOISE!! This was great place to stay in and we would definitely come back! A taste of old Hawaii. Back again! My wife and I loved our visit so much last time that we came back and booked the same condo we did before. Ron and Paula are still there and as friendly and helpful as ever getting us settled in. We end spotted a resident working cat taking a nap on our lanai and was friendly enough to let us pet him. If you want a taste of what’s it’s like owning a quiet condo on the beach, this is the place for you. We could hear sugar beach from our lanai, but we enjoyed how quiet it was otherwise. This was an amazing place! The unit was beautiful, and so close to the ocean. In the evenings, folks staying there line up their chairs to to watch the sunset. What a way to meet new friends! There is so much to do with town and activities being so close. We even joined the local outrigger club one day for a row in the ocean–incredible! We totally recommend this place. It was perfect! Great location on the beach! Family dinners on the patio. We’ve been coming here for 30 years. It’s still the same!! Best deal in town. 15 minutes to Wailea and 30 minutes to Lahaina!! Right on the beach. Amazing management. Clean well equipped condo. Centrally located. Quiet. Beautiful. Great for sunsets and lovely clean beach. Good bbq and front grassy area to watch the world go by. Close to the ocean, cooked our own meals and took it one day at a time. Large single bedroom (sofa bed in the lounge room) cabins, entirely self contained with nothing between you and the beautiful Sugar Beach. Take off your watch, switch off the phone and grab a book to read on the lawn while you watch the ocean and sunset. This condo is right on the beach (4 miles+) beautiful sunsets. Small pool to cool down before walking to the beach. The rooms are spacious and quiet. The condo is fully equipped with everything you would need for a getaway from it all vacation. The resident manager’s Paula and Ron are very helpful. From reading other reviews, I knew ahead of time that these condos were dated so there was no surprise there. The units and property are all very well kept and there is a nice lawn and small beach to enjoy the views and an evening cocktail. The Kihei Kai management is phenomenal! We had a couple of issues that came up and Ron got on them immediately (even helping us with our ineptness with TV remotes!). The friendliness of everyone that we met there; management, owners and travelers, was unlike anywhere else we have stayed on Maui. I would absolutely stay at Kihei Kai again! Our condo was clean, homey, and had everything we needed to be comfortable and to cook and enjoy the beaches. It is right on a quiet beach. The shady lanai and small swimming pool were a bonus. The managers were friendly and helpful. 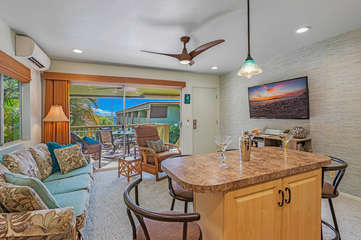 The location is convenient to the rest of Kihei and only a fifteen minute drive from the beaches of Wailea and Makena. We enjoyed the beach and weather. Condo was pretty nice, not 5 star but we did not pay 5 star prices. People were friendly and social. The pool, while small, was nice to splash around in too. Enjoyed the tropical breezes while reading! Fully equipped, even a beach chair, blender, everything you can imagine … Very central to go to every corner of Maui, calm beach in front. I arrived on a Sunday and my key and directions were at the reception waiting for me. I did not use the pool because who needs one on Maui ??? Loved it !! We stayed 5 days at unit 21) ! The condo was very clean, well equiped and very close to the beach. It is a good central location if you want to explore the island of Maui. We had a very warm welcome 🙂 We highly recommend it ! These condos are in an older part. It is very small and manageable. 2 floors. We had Condo # 3 on the lower floor. Fantastic! While having breakfast on the terrace we had a view of the sea, falling asleep we heard the sound of the sea. Kitchen very big with everything! Pool towels, 2 beach chairs, diving goggles, etc. One arrives and feels immediately comfortable. Ideal location for excursions! Unfortunately, the sea is not very nice to look through the dark sand! Very dark and cloudy! For children ideal point for bodyboarding – waves but not too big! The pool is small and deep – almost always had it for us alone!